Setting up small groups in ChurchSuite is quick and easy. To add a small group to your ChurchSuite account, simply go to "Small Groups" > "Groups" and click Add group. Fill in all the details for the group - the group Name and group Start Date are required fields. Use the drop-down selectors to specify when the group typically Meets - either selecting the group's meeting frequency and day from the drop down lists, or select "Custom" and enter a free-text description for irregular frequencies e.g. "Mondays in term time only", "First and Third Thursdays Monthly", "Various days and dates to be advised". The group's Location and Postcode can also be specified. You can provide a generic location name and partial postcode if you wish e.g. "Bill & John's House, Beeston, NG4". Multi-site churches will be able to set the Site that the group belongs too. Small groups can either be site-specific or "All sites". 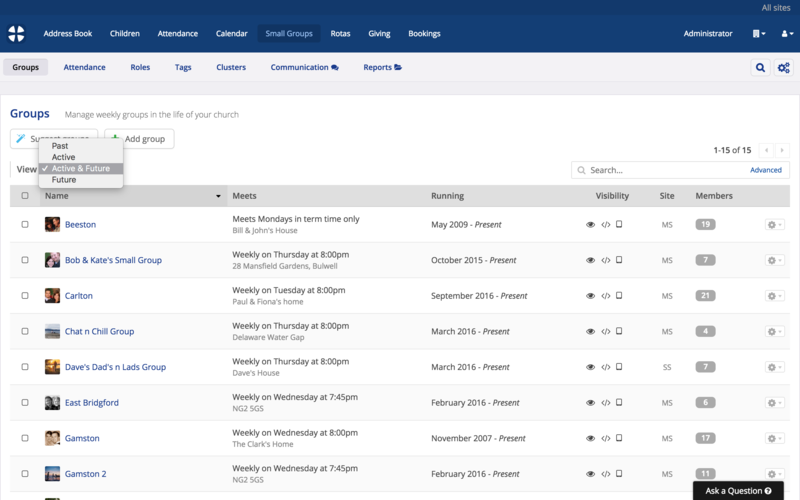 Many of ChurchSuite's reports include the option to filter by the group's Meets on day. For groups where a "Custom" Meets on has been specified, the Various Days report filter option should be used to match groups with custom, unspecified meeting days. Optionally upload an Image for the group - perhaps a photo of the group leaders - PNG or JPEG file formats are accepted. You can optionally group your groups together in categories using Group Tags. You can also assign a group to a group Tag. Tags are a helpful way of grouping together groups around something they each share in common. Once groups are tagged, group tags can be used as filters in many of the Small Group module's reports, and also for helping prospective group members find appropriate groups through the Group List (in Connect) and Small Group Embed - for example, you could create Tags for the focus or suitability of the group for new believers, newcomers etc. See the related support articles for more information about group tags. If the Cluster oversight feature has been enabled in your Small Groups module's settings, you'll be able to assign the group to a cluster. A group can only be assigned to one cluster. Finally, add an optional group description to tell prospective members about the group - perhaps something about the leaders or the purpose/focus of the group - a great way to publicise the itinerary for the coming term and for prospective small group members to better understand what the group is about before signing up. Continuing down to the next section of the Add group page, set the group's Visibility and Sign-Up settings as appropriate. If you have enabled Sign up through Group page you can now specify the other sources through which sign-up is available - through My ChurchSuite, through Embed, through Connect. These 3 options are only available if Sign-up through Group page is first enabled. Where sign-up is enabled, you must set the Dates within which people can sign up. A start date is required, but the end date is optional if you wish to allow ongoing sign-up. 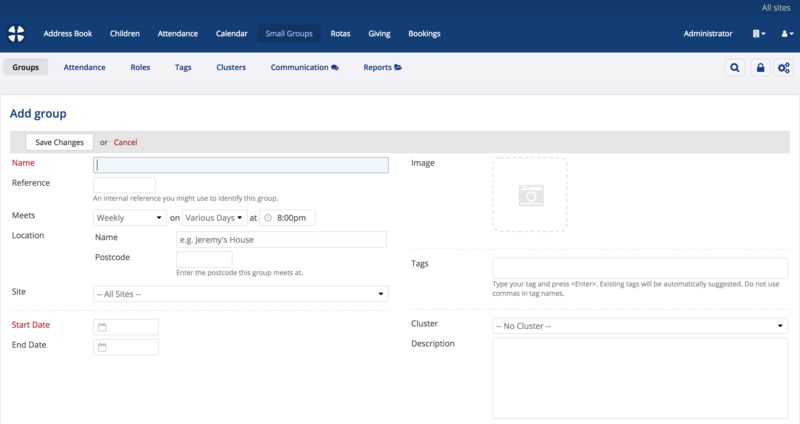 Specify any maximum group Capacity (optional, perhaps based on the venue size), and select when group members are able to view the Member List of other group members when they view their group within My ChurchSuite - the member list can be set as visible Immediately, or After sign-up ends. With the latter option, the member list will never be visible if an end date has not been specified. Finally in this section you can select the Member Status of new group members when they sign-up - new group members can be added or signed up to the group with either an active or pending status. Active group members are joined immediately to the group and are able to view the group member list in My ChurchSuite (subject to the Member List visibility setting); Pending group members are added, but must first be approved (set active) by the group's leaders before they are able to view the group member list in My ChurchSuite. Pending status group members will not receive group emails sent by fellow group members from within My ChurchSuite until they are set active. 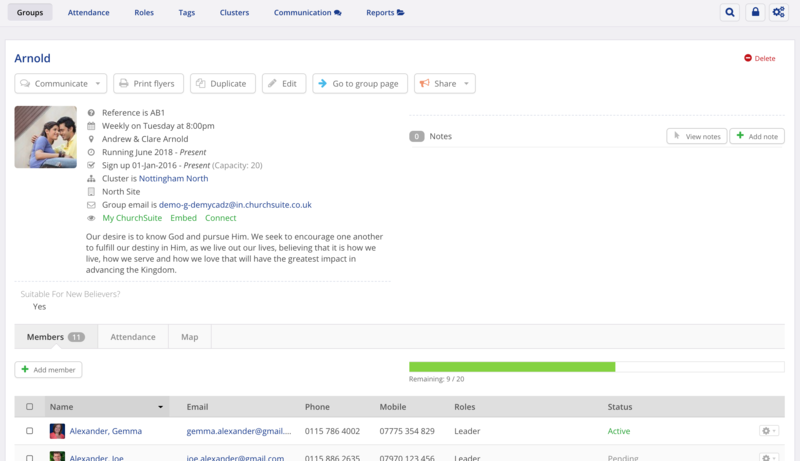 Subject to their role permissions, small group leaders are able to set pending group members active from within My ChurchSuite, or a User can set them active from the group page in the Small Groups module in ChurchSuite. Lastly, take time to compose a welcoming confirmation email that newcomers will receive when they sign up to the group. Remember to save the changes before navigating away from the page. The new group is now displayed. 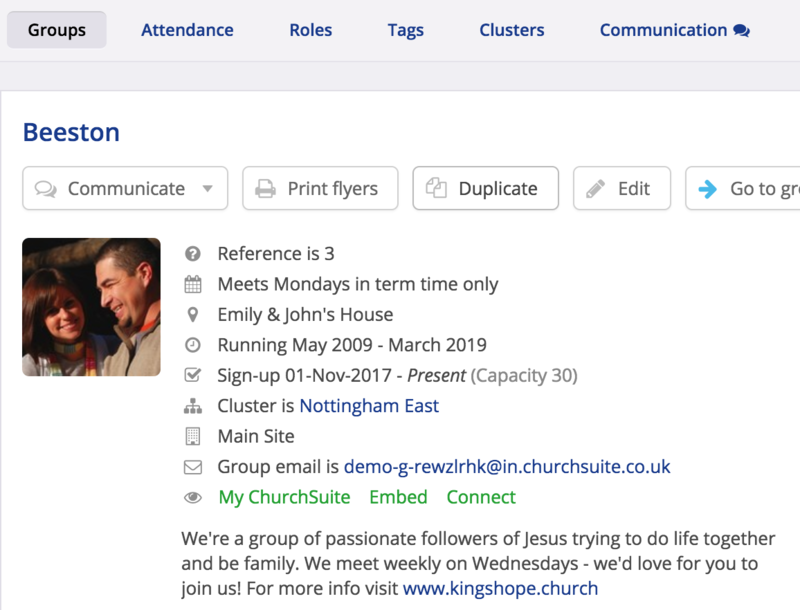 Notice the button options available to you at the top of the page, including Go to group page, which will show you the public-facing group page that prospective group members will see - for example, you could embed the URL of the group's page in your church communications. Subject to the group's visibility, the group page is also seen in My ChurchSuite, Embed and Connect by those clicking through from the menu of groups available in those places. The Share button provides options to optionally share the group page on social media channels. Finally, notice that the group page has 3 tabs - Members, Attendance, and Map. New groups are added to the group list accessible in the Small Groups > Groups section of the Small Groups module. Active and Future groups are listed by default, but note how you can select between viewing Past, Active and Future small groups - if your new group isn't listed, check that you're viewing the correct group status! 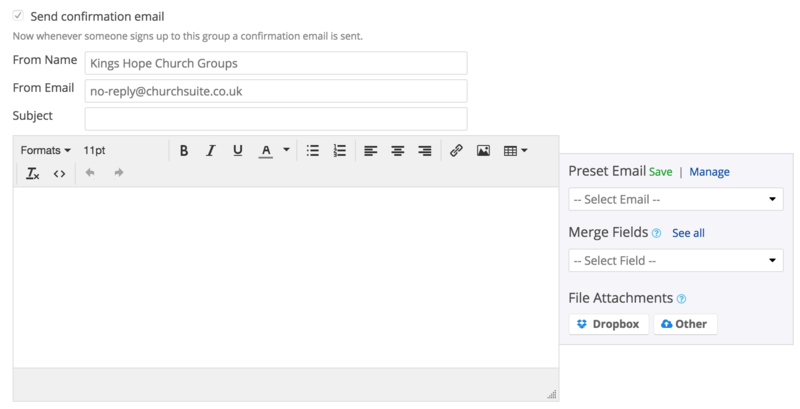 You can speed up the process of creating multiple new groups in ChurchSuite by using the "Duplicate" option. This feature is also useful if you run termly groups that are re-birthed each term in order to facilitate a new sign-up period to engage newcomers and re-engage existing members, or if you're re-activating a previously archived group and want to re-use the same group settings. Duplicating a group has the effect of duplicating every aspect of your small group settings, including the group visibility and sign-up settings, and optionally, the members and roles of the group. You can of course edit all or some of the group details once the group has been duplicated. When duplicating an existing group, notice the checkbox option to duplicate the members list (and the assigned member roles). If you just want to duplicate the group and it's setting, but not the members and roles, remember to untick the Duplicate members checkbox before saving the changes to your duplicated group. You can also duplicate a group by selecting "Duplicate" from the action cog on the right-hand side of the group you would like to duplicate. You are then taken to the "Add Group" page where you can now rename your duplicated group, set the start/end dates and the group visibility/sign-up settings. Note that setting a start date ahead of today's date will make the group a "future" group and may therefore not be immediately visible when you return to the Group list. Simply switch to display "Future" groups or "Active and Future" groups to see your new group (see below).